The LoboDMS plugin’s function is to collect emails. It is not connected with the contentACCESS LoboDMS storage. The plugin uses a separated storage type in LoboDMS instead, where the emails are stored. The plugin scans the configured mailboxes for what is defined in the Processing pattern and then according to the configuration decides whether the email should be sent to LoboDMS and have a category applied. The category signalizes the user that this email was already processed and will be found in LoboDMS. Go to Custom plugins -> Jobs, click +New. 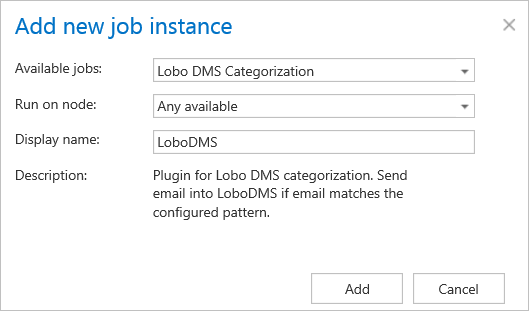 In the popup window select the Lobo DMS Categorization and provide a display name. Processing pattern – Regular expressions which will be tested against the email subject. If the email subject matches the expression, then the email will be transmitted into LoboDMS. Categories to skip – It is a comma separated list of categories. The plugin will skip any email having a category from this list, even if the processing pattern matches. Category to apply – The category that will be aplied to the mails which were processed and sent to LoboDMS should be provided here. Message format – The format of the message in which the email will be sent to LoboDMS. Repository – The repository ID which is defined in LoboDMS. Document type – The type defined in LoboDMS, where the emails are stored. Enable bookmarks – The plugin processes folders. Items are sorted according to the modification date. If bookmarking is enabled, then plugin saves the last processed item modification date and in the next run it will process items from exchange which are younger than the bookmarked. If it is turned off, then it will request all items from exchange and will skip items which were already processed. The plugin uses the server and credentials specified here for communication with the given LoboDMS instance. The plugin requires a database, where some data will be stored during the run and configuration. Exchange connection which the plugin will use to connect with exchange. New connection can be added in Exchange connections tab. According to the exchange settings, here you can select mailboxes and groups, which will be processed by the plugin. Select here, when you will need to get notification emails from the plugin. It is possible to set here, if you need a notification email always/never, or, you need it only if an error/warning occurred during the process − for example, if the processing of one or more items failed, then you may get a notification email about this error. Into the Recipient list textbox insert the email addresses of the people whom you would like to send these emails to – if there are multiple recipients, the addresses must be separated by “,” or “;”. Set the value, which will determine how many threads will process the selected mailboxes simultaneously. The recommended value is 2, as in our case.